The incredibly supportive and extremely talented Elizabeth from The Notepasser was kind enough to share this lovely thematic post. Be sure to check out Elizabeth's Blog HERE, her articles are incredibly inspiring and informative and she creates amazing illustrations to match. My childhood in the eighties and nineties revolved through (by today's standards) almost quaint sci-fi movies like "E.T.," "Flight of the Navigator," and "Blade Runner." The Netflix original "Stranger Things" hinges on this same nostalgia of my generation — an amalgam of Spielburg-esque movies from a kid point-of-view, creepy sci-fi, and Winona Ryder. It's set in a quaint rural town, follows kids who roam free on their bikes and in and out of basements and has a great soundtrack. Out of its popularity, we have a new wave of interest in weirdo characters, kid gangs, and again, Winona Ryder. I think it's safe to say we've reached peak "Stranger Things." Exhibit A: There's a text generator just so you can type whatever you want in the retro-y title sequence font. Exhibit B: A "Stranger Things" theme party in Bushwick, Brooklyn. Bushwick! Exhibit C: Winona is back on the covers of our magazines. But even as minimalist wary of trends, I'm finding myself drawn to a mix of sci-fi themes, badass women who can rock a shaved head à la Eleven, and slick makeup trends — just in time for Halloween. I'm not so obsessed I would buy all of these items (or shave my head), but I would try something in the shadow of a trend — a slash of silver eyeshadow, a dress in a dark galactic print, or a dope new lamp for cross-dimensional communication. 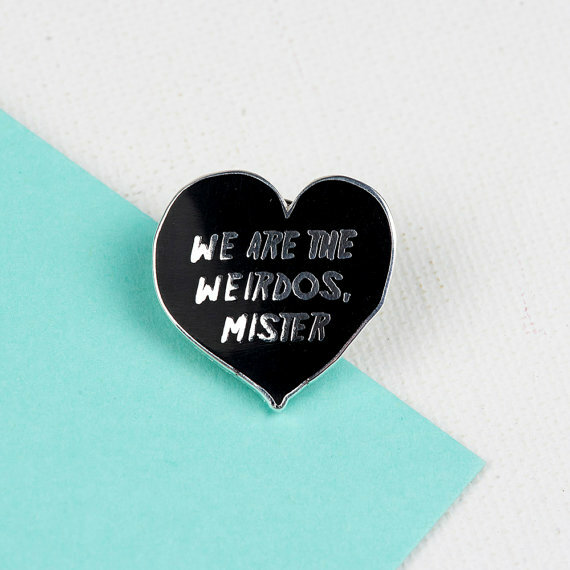 And The Craft pin. Definitely the pin. Happy hunting, weirdos! All items are vegan and palm oil free. Click through the images to products (many of which are on sale! ).